Master Wu Lian-Zhi in the typical stance of Baji Quan style. Bajiquan (Chinese: 八極拳; pinyin: Bājíquán) is a Chinese martial art that features explosive, short-range power and is famous for its elbow and shoulder strikes. It originated in the Hebei Province in Northern China,[self-published source] but spread to Taiwan and other places. Its full name is kai men baji quan (開門八極拳), which means "open-gate eight-extremities fist". Baji quan was originally called bazi quan (巴子拳 or 鈀子拳) or "rake fist" because the fists, held loosely and slightly open, are used to strike downwards in a rake-like fashion. The name was considered to be rather crude in its native tongue, so it was changed to baji quan. The term baji comes from the Chinese classic, the Yijing (I-Ching), and signifies an "extension of all directions". In this case, it means "including everything" or "the universe". The first recorded baji quan teacher was Wu Zhong (吳鍾) (1712–1802). Other notable teachers included Wu Xiufeng (吳秀峰) and Li Shuwen (李書文) (1864–1934). The latter was from Cangzhou (滄州), Hebei, and acquired the nickname "God of Spear Li". A Beijing opera Wu Shen (martial male character) by training, he was also an expert fighter. His most famous quote is, "I do not know what it's like to hit a man twice." Li Shuwen's students included Huo Dian Ge (霍殿閣) (bodyguard to Pu Yi, the last Emperor of China), Li Chenwu (bodyguard to Mao Zedong), and Liu Yun Qiao (劉雲樵) (secret agent for the nationalist Kuomintang and instructor of the Chiang Kai-shek's bodyguards). Baji quan has since acquired a reputation as the "bodyguard style". Ma Feng Tu (馬鳳圖) and Ma Yin Tu (馬英圖) introduced baji into the Central Guoshu Institute (Nanjing Guoshu Guan 南京國術館) where it is required for all students. Prominent branches and lineages of the art survived to modern times, including Han family Baji, Huo family, Ji family, Li family, Ma family, Qiang family, Wu family (from Wu Xiefeng), Wutan Baji Quan and Yin Yang Baji Quan. Each has its unique elements, while sharing core practices. Some lineages are more common or only exist in Mainland China, while others have spread to Western countries. Wutan Baji is the most common lineage in the West today. Originally from Taiwan, where its founder, Liu Yunchiao, lived. This lineages includes additional arts which are taught alongside Baji, such as Piguaquan and Baguazhang. Jian Diansheng >> Li Shuwen >> Liu Yunchiao >> Adam Hsu and Tony Yang  >> Many students in Taiwan and abroad (taught by either Hsu or Yang). Baji of Nanjing was introduced to the Guoshu Institute by students of Zhang Jingxing, Han Huiqing and Ma Yingtu. Han had a great influence on the spread of Baji in southern China, to the point that there was a saying ‘bei li nan han’ meaning ‘Li [Shuwen] in the north and Han [Huachen] in the south’. Meng Village (Mengcun) is said to be the original birthplace of Baji Quan, or at least the modern versions of the art. Baji is still widely practiced there. Wu Xiufeng (1908–1976) is the "grandfather" of many modern Baji lineages. The following lineages came down from him. A branch of the art which has mutual influences from Jingang Bashi—the second art practiced by Tian Jinzhong. Wu Xiufeng >> Tian Jinzhong >> Shen Jiarui >> Zhou Jingxuan >> Many students in China and abroad. The creation of Zhao Fujiang, who combined his knowledge of Baji, Xingyiquan and Yiquan to create a new art form. Wu Xiufeng >> Zhao Fujiang >> Many students in China. Baji quan opens the opponent's arms forcibly (qiang kai men 強開門) and mount attacks at high, mid, and low levels of the body (san pan lian ji 三盤連擊). It is most useful in close combat, as it focuses on elbow, knee, shoulder and hip strikes. When blocking an attack or nearing an opponent, baji quan techniques emphasize striking major points of vulnerability, namely the thorax (trunk of the body), legs and neck. Zhou Jingxuan of Tianjin, holding a typical Baji Quan posture. The sideways-protruding elbow is often used for striking in this art. Ding 頂: using the fist, elbow or shoulder to push forward and upward. Bao 抱: putting arms together as if hugging someone. It is usually followed by Pi 劈 (splitting). Ti 提: elevating the knee to hit the thigh of the opponent, or elevating the foot to hit the shin of the opponent, etc. Dan 單: using a single move. Kua 胯: using the hip. Chan 纏: entanglement with rotation around the wrist, elbow and shoulder. These striking techniques are related to traditional Chinese medicine, which states that all parts of the body are connected, either physically or spiritually. The forms of baji are divided into armed and unarmed routines. There are 20 fist forms, which include 12 Baji Small Structure Fists, Baji Black Tiger Fist, Baji Dan Zhai, Baji Dan Da/Dui Da, Baji Luohan Gong, and Baji Si Lang Kuan. There are eight weapons forms, including Liu He Da Qiang (spear), Chun Yang Jian (sword), San Yin Dao (sabre), Xing Zhe Bang (staff), Pudao, and Chun Qiu Da Dao (a long two-handed heavy blade, used by Generals sitting on their horses). Most schools focus on a much smaller curriculum. Standard across almost all groups are Xiaobaji and Dabaji; two weapons forms, the sabre and the spear; a two-man training routine called Baji Duijie or Baji Duida and a series of 8 short attacking methods called the "Ba Shi" (Eight Postures), which are derived from the art of Shaolin Jingang Bashi. The major features of baji include elbow strikes, arm/fist punches, hip checks and strikes with the shoulder. 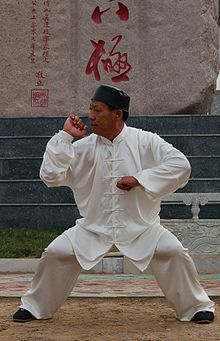 All techniques are executed with a short power, developed through training; among Chinese martial artists, baji is known for its fast movements. Baji focuses on infighting, entering from a longer range with a distinctive charging step (zhen jiao). The essence of baji quan lies in jin, or power-issuing methods, particularly fa jin (explosive power). The style contains six types of jin, eight different ways to hit and several principles of power usage. Most of baji quan's moves utilize a one-hit push-strike method from very close range. The bulk of the damage is dealt through the momentary acceleration that travels up from the waist to the limb and further magnified by the charging step known as zhen jiao. The mechanics of jin are developed through many years of practice and baji quan is known for its strenuous lower-body training and its emphasis on the horse stance. Its horse stance is higher than that of typical Long Fist styles. Like other styles, there is also "the arrow-bow stance", "the one-leg stance", "the empty stance" (xūbù 虛步), "the drop stance" (pūbù 仆步), etc. There are eight different hand poses, in addition to different types of breathing and zhen jiao. 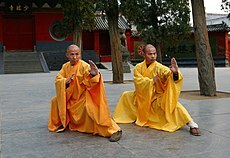 Many of these forms are also based or mixed with Luohan fist, a Shaolin style. The term ba shi may also refer to baji. The term is also used in xingyi quan. ^ Ma Mingda; Zhao Shiqing; Deng Changyou; Stanley E. Henning; Ma Lianzhen, eds. (2009). Journal of Chinese Martial Studies. Chinese Martial Studies. ^ Sensei/Renshi Nathan Chlumsky (2015). Inside Kungfu: Chinese Martial Arts Encyclopedi. Lulu.com. ISBN 13-291-1942-8. ^ Frank Allen & Tina Chunna Zhang (2007). The Whirling Circles of Ba Gua Zhang: The Art and Legends of the Eight Trigram Palm. Blue Snake Books. ISBN 15-839-4189-4. ^ a b "bajimen.com". bajimen.com. Retrieved 2009-01-07. ^ Nick Wong (4 February 2016). "Wu Tang and the Three Levels of Martial Artist". Vice Sports. Retrieved 2016-12-29. ^ Randell Stroud (2010). SanshouXingYiQuan: & Commentaries on Modern Martial Arts. ISBN 05-575-8753-0. ^ Chris Crudelli (2008). The Way of the Warrior. Dorling Kindersley Ltd. ISBN 14-053-3750-8. ^ a b "bajimen.com". bajimen.com. Retrieved 2015-11-14. ^ "Li Shu Wen". goldeneaglemac.com. Retrieved 2015-11-14. ^ "bajimen.com". bajimen.com. Retrieved 2015-11-14. ^ "AHKFS Home Page". adamhsu.com. Retrieved 2015-11-14. ^ "Tony Yang's Wu Tang Center For Martial Arts". wutangcenter.com. Retrieved 2015-11-14. ^ "2 Heroes of the Central Guoshu Institute". Masters of the IMA. Retrieved 2015-11-14. ^ "Brief history of Baji Quan". Wu Family BajiQuan. Retrieved 2015-11-14. ^ Grandmaster Shen jiarui - Bajiquan Black Tiger form. YouTube. 19 January 2007. Retrieved 2015-11-14. ^ "Home". weebly.com. Retrieved 2015-11-14. ^ "Cook Ding's Kitchen: Master Zhou: The Man, The Artist, The Teacher". cookdingskitchen.blogspot.co.il. Retrieved 2015-11-14. ^ "Shang Wu Zhai שאנג וו ג'אי - ביס לאמנויות לחימה". Shang Wu Zhai שאנג וו ג'אי - ביס לאמנויות לחימה. Retrieved 2015-11-14. ^ YouTube. youtube.com. Retrieved 2015-11-14. ^ "阴阳翻拳功". baidu.com. Retrieved 2015-11-14. ^ Jaw, Peter (2004). The Treasure Book of Chinese Martial Arts. 1. Authorhouse. ISBN 978-1-4140-7573-0. ^ "Xingyi". Perry Lo and the Shou-Yu Liang Wushu Taiji Qigong Institute. Retrieved 2009-01-07. ^ Jaw, Peter (2007). The Treasure Book of Chinese Martial Arts. 2. Xlibris Corporation. ISBN 978-1-4257-8571-0. Hollowfist.com - Essays about Bajiquan's internal theory. Wikimedia Commons has media related to Bajiquan. This page was last edited on 25 March 2019, at 19:49 (UTC).